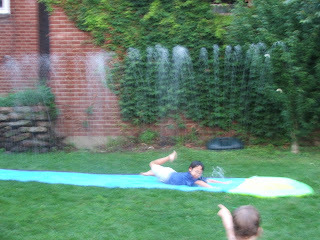 After dinner some neighbors were trying out their new slip and slide and so my kids had to go over and investigate. It was pretty close to bedtime and so I just let them go on it in their clothes. The battery on my camera is dying and so a lot of these photos are blurry. 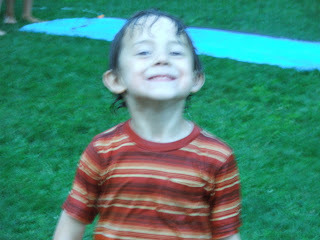 James had no hestitation after he got permission to get wet. Margaret is alerting me to the actions of her brother. For some reason getting your clothes wet is very exciting. Immediately after this photo was taken Henry announced that he was cold. He needed a towel right away. Thank goodness I just washed towels this afternoon. Silly me, I thought he was going to use the towel to warm up. 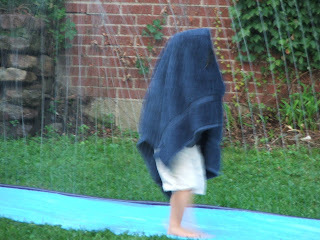 Instead he decided to wear the towel in the slip and slide to stay warm. 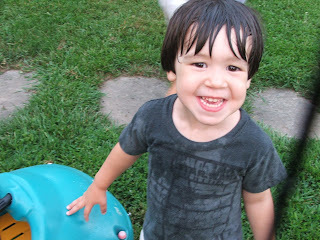 Watching him get through wet grass and a dozen children with the towel wrapped around his face was a riot. And now that I look at this towel I realize that it is not even our towel! 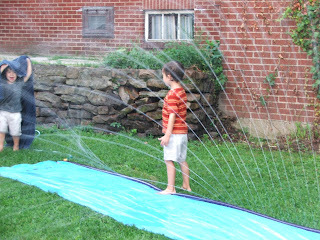 Isaac learned that if you stand on the spray you can direct the water. Here he is drenching Henry (who is still wrapped in his now very wet towel to stay warm). 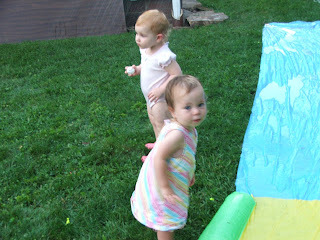 Margaret showed her courageous side and ventured into the spray of the slip and slide. I think she was showing off for her little buddy. 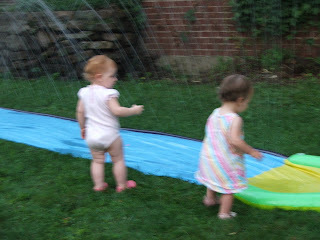 Not to be outdone, her little buddy was soon going down the slip and slide with the big kids. Sweet pics. What fun they were having!